Vishal-Shekhar‘s Dheere Dheere which opens Walkaway is perfectly in sync with the feel of the movie, very urban, very peppy, in a pleasantly Vishal-Shekhar way. Shekhar doubles up as vocalist as well, pulling it off in style. 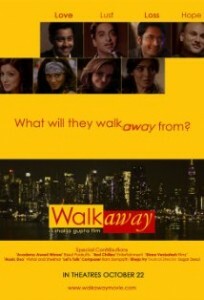 Composer Sagar Desai ends his year-long drought with three songs in Walkaway. First one, Rozaana, sounds almost like a leftover track from Straight, in its general feel and the fact that this one too is rendered by Suraj Jagan. No negative connotations to the statement though. A very soothing track. His song no. 2, Bonds Fell Apart, sees a surprising mix of Tamil and French(? )lyrics, the former handled by Raman Mahadevan and latter by Shibani Kashyap. A beautiful song with a faint East European flavour in arrangement, I loved the way the violin was utilised. And very good singing too. Woh Pal is a Hindi version of the song, and is sung by the same singers. In spite of same arrangement for both tracks I prefer the crossover version over Hindi. Ram Sampath is up next with Banna Banni, a marriage song sung by Sona Mohapatra and Kirti Sagathia. Not upto his usual standards this one. The tune itself is pretty ordinary and the synth elements in arrangement only make it worse. The singing is good, but not enough to keep you hooked to Banna. However his other offering, the rework of the traditional Rajasthani folk song, Banna Re, works really well (though I am not sure how much of the credit goes to the actual folk song and how much to Ram!). Sona and Ghani Mohammad Sirajudeen Khan make excellent use of their classical base to do a fab job of the rendition. And in comes the last composer, Samrat Chakraborthy, who also acts in this movie. His solo composition, Dil Diya, is a classical track sung by Savita Ahuja and is more functional than it is entertaining. In Yet Alone, Samrat teams up with Kurush Mistry. Sung by Roo, this song is pleasant, but not bound to stay in mind for long, probably owing to a functional nature. And the final song, I Ain’t Got Nobody, has Samrat joined by Radovan Javeicevic in arranging a jazz-based track, rendered by another actor from the movie, Manu Narayan. It may find its followers among fans of the genre but otherwise not sure how many people would find this one alluring. Though the soundtracks of multi-composer flicks turn out to be a forgettable affair many a times, they do work once in a while. And Walkaway is fortunate to be in the latter, thanks mainly to Vishal-Shekhar and Sagar Desai.